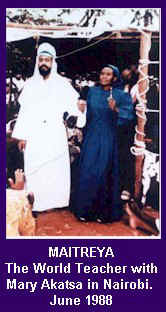 On 11 June 1988, a man suddenly appeared before a vast crowd in Nairobi, Kenya, gathered to witness healing prayers. Instantly recognizing the tall, white-robed figure as "Jesus Christ," the crowds fell down overcome with emotion. The editor of the Swahili edition of the Kenya Times, veteran journalist Job Mutungi, witnessed the event and took some pictures. A summary of his article as it appeared in his newspaper follows. About 6,000 worshippers at Muslim Village, Kawangware, Nairobi, believe they saw Jesus Christ, in broad daylight last week. The scene was at the Church of Bethlehem, where Mary Sinaida Akatsa conducts miracle prayers, praying for the sick, the blind, cripples, mad people, and the barren. Worshippers were singing Mungu ni Mwema, a popular Swahili hymn, when Mary Akatsa interjected. She announced that God had spoken to her and told her to "await a miracle because a very important guest would be coming to give her a very vital message." Five minutes later, she asked those who were singing to stop as the messenger had arrived. "Jesus! Jesus! Jesus of Nazareth!" went the loud whispers from the crowd as they raised up their hands in divine welcome. "We are nearing the time for the reign of heaven. But before that I shall come back and bring a bucketful of blessings for all of you," the man said. 1.The man of Nairobi was Maitreya. His appearance was in keeping with the crowds expectations of Jesus Christ, hence his bearded face and biblical robes. 2. The "bucketful of blessings" with which Maitreya promises to return is an allusion to himself as the 'Water Carrier,' the symbol of the Aquarian Age. 3. The correct translation of the Swahili word used by Maitreya is pitcher, not bucket. The "strange sporadic light" emanating from Maitreyas head and feet described by Job Mutungi are also habitually seen by those around Maitreya now.